Nebraska lost to BYU, 33-28, on a last-second pass (probably rude to call it a “Hail Mary” from BYU) from backup quarterback Tanner Magnum to Mitch Mathews. It’s a rough start for head coach Mike Riley as head coach of Nebraska, and there’s a lot to digest from the game (not to mention a few game-day snacks that remained un-digestible after Mathews’ receptions). Second-Half Adjustments. After coming out like a house on fire, Nebraska looked for all the world like a team about to collapse in the second quarter. BYU scored 17 unanswered points, and likely left more on the field when running back Algernon Brown dropped a wheel route on fourth down near the end of the quarter. BYU quarterback Taysom Hill was having his way with Nebraska’s defense, and Nebraska quarterback Tommy Armstrong reverted to his 2014 form. But in the third quarter, after Nate Gerry intercepted Hill, the worm turned. Hill was only 3-7 passing before being replaced by Magnum, and BYU’s offense stalled. The Blackshirts were able to apply pressure, sacking Hill twice in the third quarter. Nebraska was able to establish a rushing attack, and Armstrong rediscovered his first-quarter passing mojo. Welcome Back, Alonzo. When kick returner and wide receiver De’Mornay Pierson-El went down with injury, one of the many questions raised was who would fill his role as a speed threat for Nebraska’s offense. Against BYU, we may have learned that junior wide receiver Alonzo Moore might be a big answer to that question. Moore had three receptions for 48 yards, including a sideline-threading touchdown scamper. He was also utilized (along with Jamal Turner) in the running game, getting two carries for 24 yards. Injuries have prevented Moore from making a contribution in previous years. But a healthy Moore might well be a huge part of bridging the gap until Pierson-El’s return. Freshman Performances. Nebraska had standout performances from true freshmen on both sides of the ball against BYU. Dedrick Young was pressed into service at linebacker, even when Nebraska played more nickel sets than we would normally see from defensive coordinator Mark Banker. Young was ready for the moment, able to make plays in space and stay on his feet to keep lane containment. In quite a trial by fire against BYU, Young has put his name in ink on the depth chart for the foreseeable future. On offense, wide receiver Stanley Morgan was exactly as advertised. The star of fall camp, Morgan found his way onto the field in the second half, ending the game with two receptions for 19 yards. Tellingly, he was also the guy called on to be the second punt returner (along with Jordan Westerkamp) in response to BYU’s rugby-style punter. Nebraska has good depth at wide receiver, even with Pierson-El’s injury. But Morgan’s emergence should get the attention of Nebraska fans – not to mention Nebraska recruits like Keyshawn Johnson Jr. (in response to a suggestion that he notice how the #Huskers were using their wide receivers). The Second Quarter. As the game opened up, it looked like the team with the ball last might win the game, with each team exchanging scores. But then, in the second quarter, things began to unravel. Armstrong started missing receivers high. Running lanes opened against the Blackshirts, and receivers became uncoverable. BYU scored 17 unanswered points, and looked like it was going to run away and hide with the contest. Anyone having flashbacks of Nebraska’s second quarter in Madison last year could have been forgiven. This year was always going to be a challenge for Nebraska, trying to transition from Bo Pelini’s schemes and philosophies to Riley’s. It was hard not to see some of the traits of a Pelini-led team in that second quarter, and it allowed BYU to put enough points on the board to ultimately win the game. Combine that with BYU’s big receivers (six-foot-six Nick Kurtz and six-foot-six Mitch Mathews) against Nebraska’s cornerbacks (six-foot-one Daniel Davie and six-foot-one Joshua Kalu) and the Cougars could have a favorable matchup to exploit. It was the aforementioned Mathews who was able to use his big frame to block out Daniel Davie and Nate Gerry to haul in the winning pass. Kickers. Yikes, does Nebraska have problems kicking the ball now. An injury to punter Sam Foltz has pressed scout team quarterback Tyson Brokemeyer into duty. An area that was one of huge strength for Nebraska in terms of field position has now become a glaring weakness, particularly if Foltz’s injury will keep him out for any length of time. But what might be more disturbing is the performance of sophomore placekicker Drew Brown, who went 0-2 against BYU. 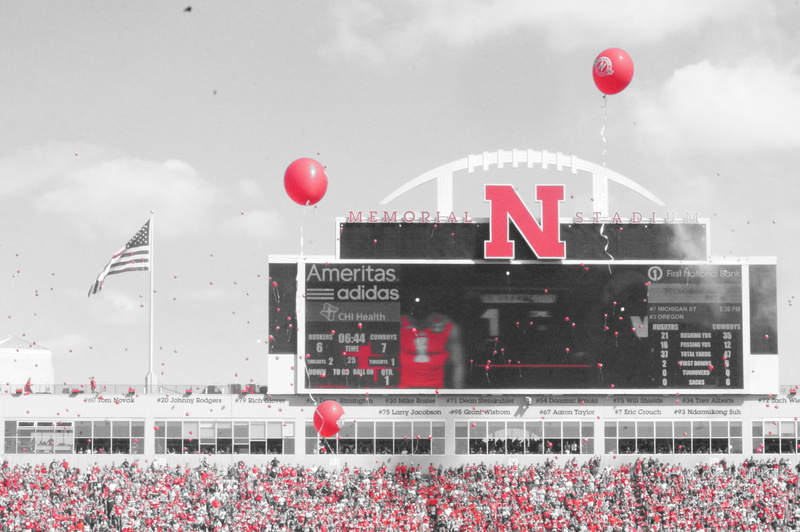 Brown missed both kicks badly, the first a 40-yarder into the wind as time expired in the first half, and the second a 41-yarder with the wind in the fourth quarter as Nebraska was trying to ice the game. Not to be churlish, but if both those kicks are made – and 40-yard field goals should be an expectation for a kicker on a team intending to win things – then the worst BYU could have done with that last play was a tie. All of a sudden, Nebraska has a huge question mark in a critical phase of the game. We’re in uncharted territory, Husker fan. As ABC seemed intent on reminding everyone, Nebraska hadn’t lost a season opener for 29 years. Assuming a win over South Alabama next week, Nebraska will still need a win on the road in Miami to avoid a 1-2 start to the 2015 campaign. Time to panic? Absolutely not. Remember, this was game one of the Riley era. In the second quarter, you could see Nebraska reverting to form from last season, both offensively and defensively. So that halftime response, where Nebraska came out and dominated on both sides of the ball, was instructive. You can see what Nebraska is trying to do on offense, stretching the field horizontally with the jet sweep action. You could see Armstrong making anticipation throws, and being effective when in rhythm and not under too much duress. Defensively, it was a little harder to get a feel for what Nebraska wanted to do. The suspension of linebacker Michael Rose-Ivey likely forced Nebraska into more nickel coverage than it would have otherwise liked, to avoid asking freshmen Young and Luke Gifford to shoulder too much of a load against a stout BYU offense. Losing an opening game stinks, especially in the manner in which the game was lost. But this loss does nothing to dent Nebraska’s chances at a division title. And Nebraska’s second-half response to BYU should provide hope for a fanbase dealing with being on the other end of a last-second desperation heave. So shake it off, Husker fan. And mark this game down in a few weeks’ time, when Wisconsin rolls into Lincoln, and see if the tough lessons learned against the Cougars pay dividends against the Badgers. I gotta say, on the whole, I felt encouraged by this game. It would’ve been nice to have the win, but you could see flashes of brilliance there. It’s gonna take time for everyone to feel consistently comfortable in the new systems, but that was a pretty good BYU team and we absolutely manhandled them for some stretches of the game. But it’s one thing to be full of potential, and quite another to be good. That’s one hump Pelini could never get over, and hopefully one that Riley does. That’s a really good point on potential versus reality. But I think this staff certainly has the ability to turn that mythical corner. I can’t get over how Nebraska looked dead in the water in the second quarter — like, to the point where if the wheel route on fourth down for BYU hit, it felt like game over — to dominating the third quarter. We’ll see this week, and much more against Miami next week, but my optimism isn’t really dented in the least by the loss on Saturday. A clunker against USA, though, and all bets are off. Thanks for the read and the comment!